You can add theft to the list of sins the NYPD has committed recently against cyclists. 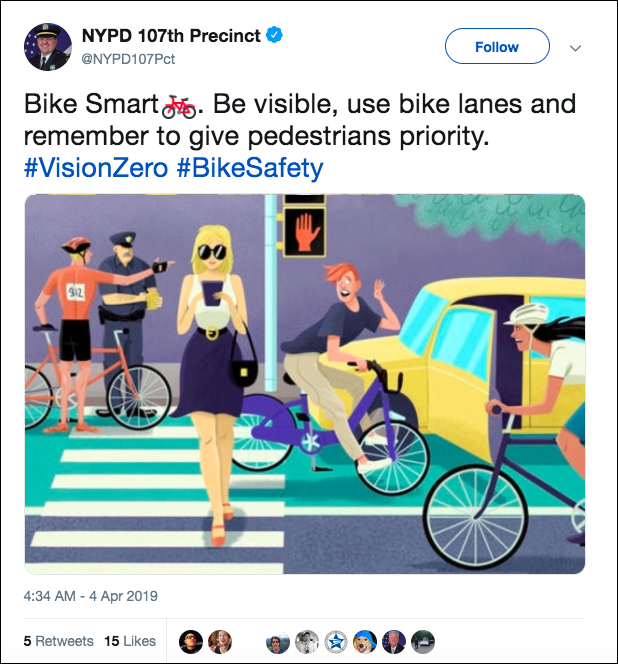 The cartoon image in an anti-cyclist tweet posted last week by the 107th Precinct in Queens — reported on by Streetsblog last week — was actually stolen from a 2017 article in Thrillist. The graphic, by artist Jason Hoffman, adorned a story in which Bike Snob Eben Weiss gave cyclists helpful hints on avoiding trouble in the city. It was not an anti-cyclist story. Cut to last week, however, when the 107th Precinct swiped the graphic and repurposed it as a symbol of cyclist lawbreaking. “Bike smart. Be visible, use bike lanes and remember to give pedestrians priority,” the tweet said, even though nothing in the picture suggests that cyclists were not prioritizing the pedestrian, who is walking against the light without paying attention, while a cyclist gets a ticket for, it seems, no reason at all. Hoffman told Streetsblog that he couldn’t talk about the plagiarism before discussing it with Thrillist’s legal team. But he did say that no one from the NYPD contacted him about using the image. Now if I were the creator of those images I might be OK with someone borrowing them if it’s to demonstrate cycling etiquette. However, I would be incensed if someone used those images out of context, like the NYPD did. The NYPD is a proud partner of the Vision Zero mission. I guess getting tackled on your bike by a cop is part of Vision Zero, too. So is ticketing cyclists in locations where a cyclist has been killed. NYPD Commissioner James O'Neill always says he loves cyclists — but for the second time this week, his rank-and-file officers have indicated that they do not.